This release is improving the authoring experience by both enhanced performance and new features and functionalities that enable more efficient and error-proof authoring. Over 80% reduction in time for large scale changes (e.g. for updating batches of content). Update all 10,000 concepts again, inactivating the relationship to SNOMED CT and adding a new one to Clinical finding. Snow Owl 6.4 already provided a number of ways to add members to a reference set, including dragging and dropping from the hierarchy, running lexical and semantic searches and adding the members or merging already existing reference sets. In 6.5 a completely new approach has been implemented, that allows context-sensitive selection of members from the SNOMED CT hierarchy. Users can now link the reference set editor to the SNOMED CT navigator, and the members of the active reference set are highlighted in the navigator with black fonts. Concepts that are not members of the reference set are greyed out. A number is appended to the preferred term, that indicates the number of subtypes the concept has that are also members of the attached reference set. Adding a new member is as easy as navigating in the hierarchy and right-clicking on the appropriate concept. This method helps identifying potential new content, that is semantically close to already existing members but was skipped from previous versions of the reference set. Removing a member from the reference set removes the highlighting from the tree. To keep up with SNOMED International a collection of new reference set types have been implemented. OWL Axiom reference sets can now be imported, opened for browsing and exported as part of a publication bundle. New members can be added with a simple wizard. Authoring is currently not tied to automatic updates of the OWL Axiom reference sets, neither the classification is processing its content. 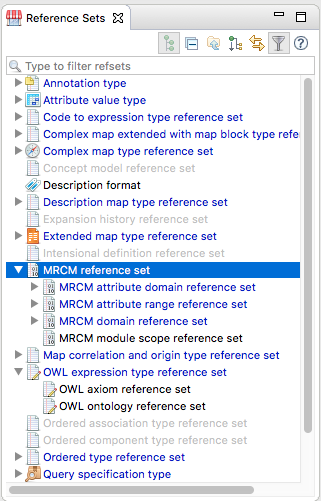 MRCM reference sets can now be imported, opened for browsing and exported as part of a publication bundle. New members can be added with a simple wizard. Authoring is currently not tied to automatic updates of the MRCM reference sets. The advanced search now allows retrieving concepts by their effective date – or in case of unpublished content, their publication status. This feature is particularly useful for collecting unpublished concepts for review before a release. 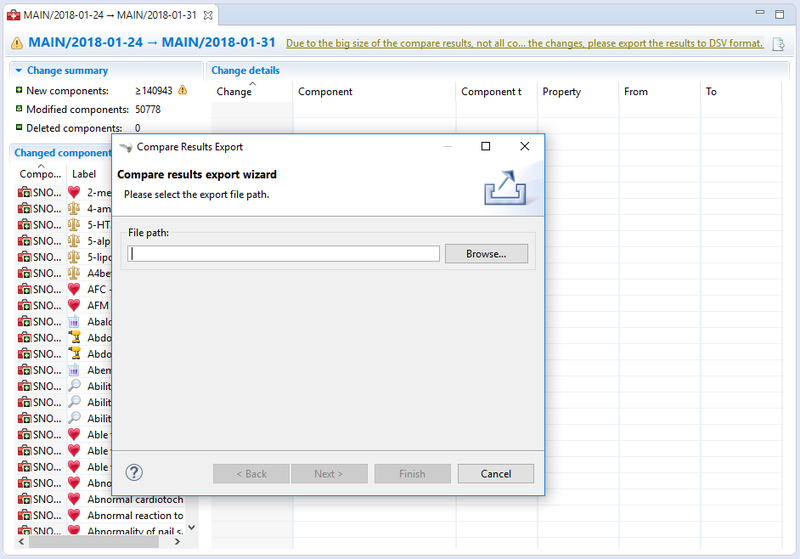 Version compare can produce large change sets between versions, that are sometimes difficult to navigate and can lead to performance issues. To avoid this, the UI is limited to display the first 10.000 changed components only. In the rare occasion that there are over 10.000 changed components, the results can be exported into a csv file for viewing and sharing.